The Short Version: In 2008, Lenore Skenazy dropped her 9-year-old son off at Bloomingdale’s in New York City with a map and some money, and she trusted him to take the subway home. She felt bursting with pride when he showed up 45 minutes later after having a little adventure on his own in the city. Lenore wrote a blog post to share her experience seeing her son grow up and take on more independence — and her story went viral. Soon NPR, The Today Show, MSNBC, and other media outlets were calling Lenore “America’s Worst Mom” and asking her to defend herself for her parenting choices — which Lenore was quite willing to do. She started writing blog posts on FreeRangeKids.com and giving speeches across the country to tell parents that it’s OK to let go of a child’s hand and give them the freedom to explore the world without constant supervision. Her groundbreaking parenting philosophy has sparked a national dialogue about what children are capable of and how parents can nurture a child’s independence in a worry-free environment. Sometimes parents just know their children are ready to do more for themselves, and other times they find out by seeing their children take on a challenge or solve a problem on their own. One mother saw her 8-year-old son’s resourcefulness firsthand when a mix-up in the after-school carpool group had him dropped off at an empty and locked house. He didn’t have a key or a cellphone, so he walked three blocks to a nearby Korean grocery store where he called his mom. She, understandably, dropped everything at work and rushed to pick up her son — only to find him perfectly safe and happily helping the grocer shelve some meats. She was amazed at how capable her son was of handling adversity and solving difficult problems. He showed her that he didn’t need parental guidance every second of the day. He could be in charge of himself. Free-range parenting means letting a child have the freedom and authority to navigate the world on their own (within reason). It’s about trusting your son or daughter to go outside and play unsupervised. It’s about trusting the world to be a safe place for your child to explore, learn, and grow. Lenore Skenazy, a journalist and advocate for free-range parenting, garnered intense media scrutiny in 2008 when she let her son ride the subway in New York City by himself. She gave him a map, a MetroCard, and money for emergencies, and she trusted him to make his way home. Some critics called her “America’s worst mom,” but their misinformed opposition only motivated her to raise awareness about what free-range parenting truly means. Today, Lenore writes about the benefits of giving children a longer leash and engineering situations where they feel empowered to become more self-reliant. When my dad was growing up in Orlando, his mom would open the front door on weekends and tell her five kids, “Don’t come back until dinnertime.” My mom wasn’t nearly as laissez-faire, but she did let my twin brother and I walk, bike, or scooter around the neighborhood in search of a game of kickball or 500. As long as we promised to stay together, she let us play wherever we wanted. It felt good to have her trust, and we wanted to live up to it. Free-range parents believe their children deserve the freedom to play on their own. They understand that the crime rates in the US are down, and parents don’t have to coop children up in the house to keep them safe. If you disagree with your partner about how much freedom or responsibility to give your child, it can be hard to come to an agreement simply because you don’t really know what your child is capable of until you give them a chance to prove themselves. You have to engineer a safe way to test your child’s resilience and challenge your partner’s fears about the worst-case scenario. You can start small by having your child buy groceries while you wait in the car or letting your child walk to a friend’s house or go to a sleepover. It’s all about gauging where you are and where they are, and giving children the chance to experience some independence. 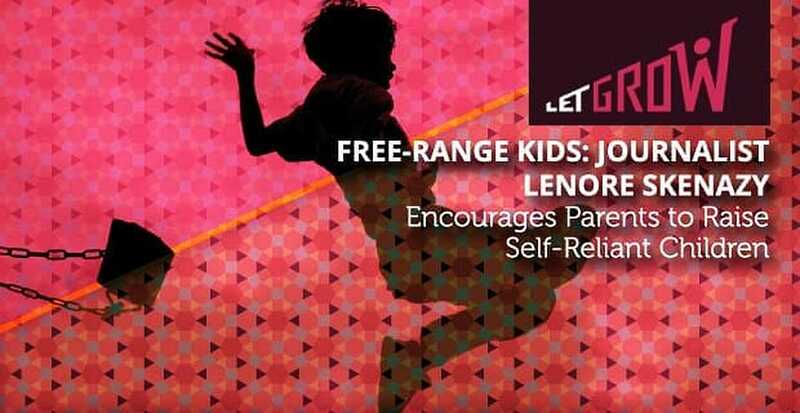 In addition to giving motivational speeches and providing parenting resources, Lenore also works closely with schools and educators to foster more opportunities for free-range parenting. The Let Grow Play Club is an after-school program where children of all ages come together on a school playground or gym to play without adult intervention. Seven schools in Long Island have taken part in this program. During the afternoon, children can come up with their own games, settle their own disputes, and have fun on their own terms. An adult stands by watching, but he or she is there in more of a lifeguard capacity. During this playtime, the children learn social skills, creativity, resilience, camaraderie, and empathy. It’s a healthy way for them to explore their ideas and develop leadership skills. The Let Grow Project encourages teachers to challenge their students to ask their parents if they can take on one extra responsibility at home. Maybe it’s walking a dog. Maybe it’s preparing breakfast. Whatever the errand or activity is, it offers the child a chance to show they’re ready to grow up and handle more responsibility. It’s helpful to allow parents to take that step together and not be the only parent letting their child walk home from school unsupervised or take a bus to dance or karate lessons. It’s much easier to let go when you know other parents are doing the same thing, and you can even coordinate to have your children walk together, so they get more socialization and you get more peace of mind. You can register on LetGrow.org to network with fellow free-range parents in your area. Lenore made a big splash in the media when she wrote a blog post about her experience letting her son take the subway home. She was asked to tell her story on NPR, MSNBC and Fox News. Pretty much overnight, she became a leader in the free-range parenting movement. Her advocacy and experience showed other parents what was possible. And many have written her to say thanks. A lot of free-range parents go on Lenore’s blog to share their stories and explain why they believe their children can handle themselves. On her blog, Lenore offers a reality check for parents who may want to try free-range parenting but feel worried or fearful about what could happen. In a section called “Really?” she debunks myths that child abductions happen all the time, that crime is running rampant, and that not keeping an eye on your child 24/7 is bad parenting. Once parents see their sons and daughters shoulder more responsibility and succeed in real-world situations, they often stop thinking of their children as helpless babies and start to realize everything they’re capable of. That’s an exciting feeling for a parent, and it’s an incredible gift for a child to have that opportunity to grow and learn on their own. Free-range parents give their children the chance to develop important life skills by getting out of the house and making their own way. They think keeping children from experiencing the world isn’t going to help them navigate it in the long run. In their view, children have to learn to take care of themselves, at least somewhat, because even the most dedicated helicopter parent can’t be there for them every second of the day. Lenore has been unapologetic in her position as the anti-helicopter-parent. She believes children can do more than some adults give them credit for, and she’s on a mission to prove it. Or rather, to give children the opportunity to prove it.